We all want our wedding dress to be special, look amazing. We’re all searching for that dress that will look stunning in our wedding photos for years to come, even as fashion changes. It is a dream to have your wedding dress and wedding photos withstand the test of time. However, you also want to choose a dress that is true to you and your sense of taste and style. You might be looking for something short, simple and fuss free. Or your dream dress might feature floral patterns and lace with a contemporary silhouette. Other brides might want to recreate an past dress design, or create an anachronistic mix of modern and past styles. Whether you are looking for a dress made from hip recycle fabric, romantic floaty lace, bold gothic tones, bohemian beaded creations, or svelte satin designs, you want to be unique. So join True Bride as we look at our Top 6 Favourite Unique Wedding Dresses, Styles and Accessories from our Bride of the Year Contest! Not only is your dress important to you, but it is also important that it draws inspiration from or is the inspiration for the whole day. 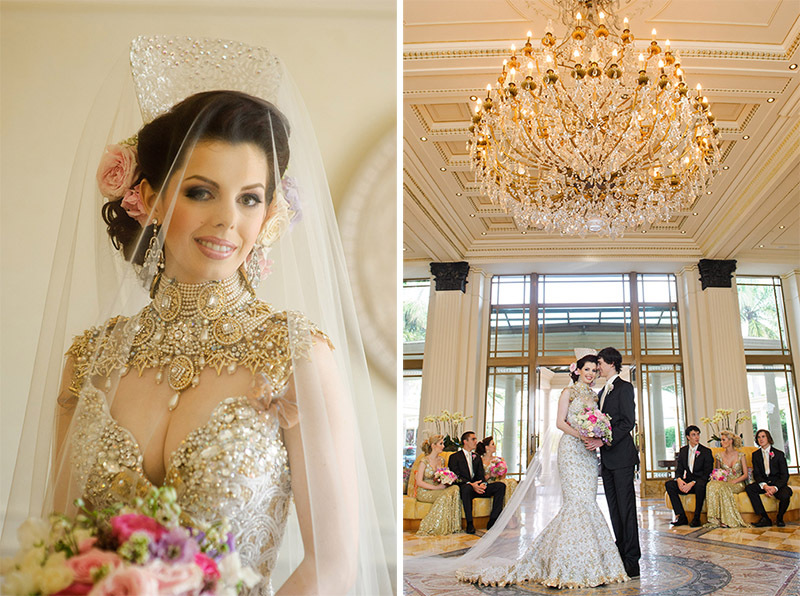 So if you want something that’s a little vintage inspired or to give ballroom feel while still svelte, why not try an ornate gold beaded wedding gown? There’s nothing like a bit of glitter and dazzle as a bride walks down the aisle. And for a bride with the flair for the bold, a sparkling dress featuring gold or silver beading is a stunning way to express yourself on your wedding day. Beaded wedding dresses a glamorous, showstopping, glittering and the perfect choice for the fashion forward bride who wants to make a statement. Further, beaded dresses come in a wide range of styles to suit any taste, from ballgown silhouettes to illusion skirts, cut outs, capes or even stunning recreation flapper dresses. With such a glittering bridal dress, it is best to keep your hair and makeup simple and let the dress do the talking. The choice of a Medieval-style gown for example, can influence the entire wedding, from the attire, the catering the wedding flowers through to the choice of wedding venue. This is also true of your head piece. If your wedding gown is very plain or has a simple back, you can add a touch of drama or personality by using an ornate headpiece. This way, when you walk down the aisle, you can make them all gasp twice. However, if you have a more ornate dress, keeping your hair and accessories simple is your best bet. Your choice of accessories and dress might also depend on your venue. For example, an outdoor wedding in a forest-y location, then an ornate headpiece or wedding dress might not be appropriate. Instead, choose something simpler and boho. A wedding set in a formal location, however, might need a headpiece and/or dress that is more ornate or formal. When considering an ornate headpiece, you need to also consider your hairstyle. Once you’ve picked the perfect hairstyle to match your dress, you can work with your makeup and hairstylist to choose the right headpiece for your look. Finally, many brides like to change their hairstyles between the ceremony and the reception, wearing their hair up as they walk down the aisle and let their hair down for dinner. So make sure you either choose an ornate headpiece that works with both hairstyles, or pick different adornments for each part of the night. But above all, stay true to your personal style. You should feel like your most beautiful and authentic self on your wedding day. When choosing your gown, consider the bigger picture, what mood are you looking to create. Theme weddings are often the most visually memorable. 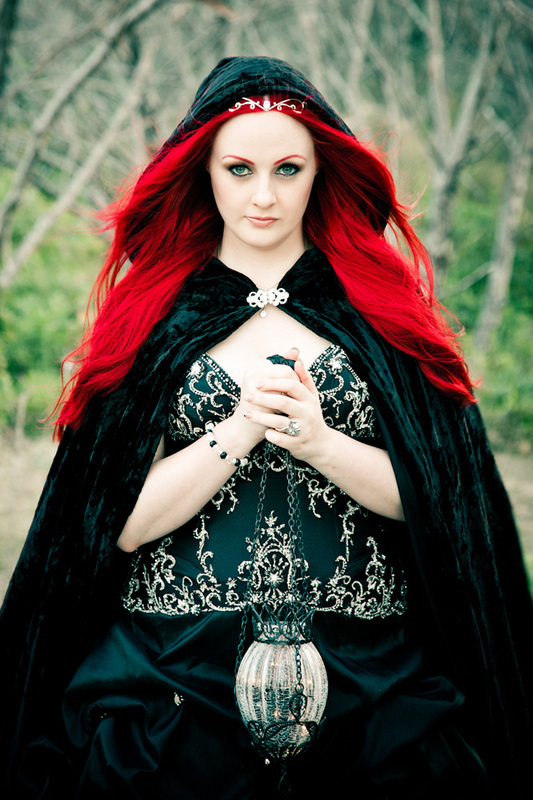 One of our favourite themed looks from our Bride of the Year contest was our stunning Gothic Bride. When you think of gothic, you probably think of red or black roses, candlelight, historical buildings and an element of dark mystery. This makes gothic themed weddings a stunning, alternate feel. A gothic bride looks amazing when she goes bold and brave and wears a magnificent black wedding dress. If you want to lift the look a little, you can add a veil and flowers. You can try adding some deep red and black flowers for the full effect. However, if you want to embrace the full gothic bridal look you can accessorise with a stunning cape and lantern, like our gorgeous Bride of the Year entrant. Finally, a stunning gothic themed wedding needs just the right touches to make it an unforgettable night. Try lining the aisle – safely – with candles. Use tall candelabras on your reception tables to add height and decorate them with peacock feathers or dripping bouquets of flowers – or both! True Bride has been online for over fifteen years. Over this time we have seen some exquisite gowns, and from time to time we see some very unique wedding dresses and unique bridesmaid dresses, which we enjoy sharing with you. One of our favourites has been the trend in gothic wedding gowns and black wedding dresses in general. They make a bold statement that is classic and outspoken. Further, a wide variety of wedding gown styles fall under the gothic term, meaning you’re free to choose a look at suits your style. Popular fabrics include velvet, satin, silk, chiffon, crepe and even heavily ornamented brocade. Other fabrics include taffeta and cotton, depending on dress styles and taste. Some wedding dress designers combine these fabrics with lace, tulle and even touches of leather to create your perfect gothic look. As well as ebony or jet black, you can go bold with a deep coloured wedding gown in amethyst, eggplant, crimson, blood or wine red, deep jewel greens, royal or midnight blue, or even silver or gold. Choose something that expresses your unique sense of style. Further, you can compliment your gothic wedding dress with stunning gothic themed makeup. You can choose black eyeliner, black lipstick with a dark matte red underneath and silver-grey or purple shadow for the eyelids. You can even add some little crystals for an extra touch. However, if you want to tone down your look a little, you can choose a make up look that is a little more natural. 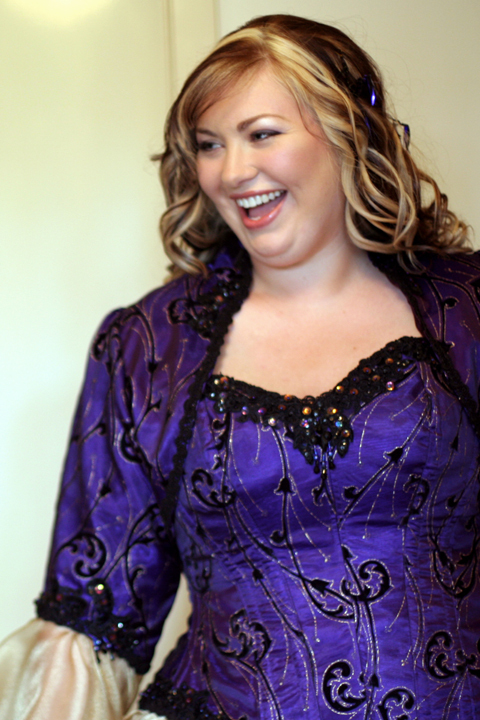 This beautiful purple wedding dress above, reminded us of the medieval era or something a little more “Old-English”. While many medieval wedding dresses tend toward white, there are plenty that are bold and choose stunning darker colours. After all, white wedding dresses only came into vogue in the 1800s, thanks to Queen Victoria. There really is no more romantic period than the Middle Ages, with stories of beautiful ladies, noble knights, great kings, and powerful queens. Modern brides can recreate this feel with the iconic medieval wedding dress, featuring stunning fluted or puff-sleeves and ruffled necklines. In fact, there are many iconic features of the medieval wedding dress, including delicate lace, patterned straps, bright colours or white featuring metallic finishes, and high quality luxurious fabrics. The ideal fabrics of choice are heavy brocade, velvet, satin or silk. Consider the time of year as well, when you choose your fabric and dress – you don’t want heavy brocade in summer! For full figured brides, you can choose a medieval wedding dress that features a plunging neckline, long bell sleeves and a dropped waist. Tall, thinner brides can go with a fitted bodice and draped skirt. Finally, match your stunning bridal gown with an elegant headdress, an ornate headpiece, or maybe full-length cape in winter or autumn weather. 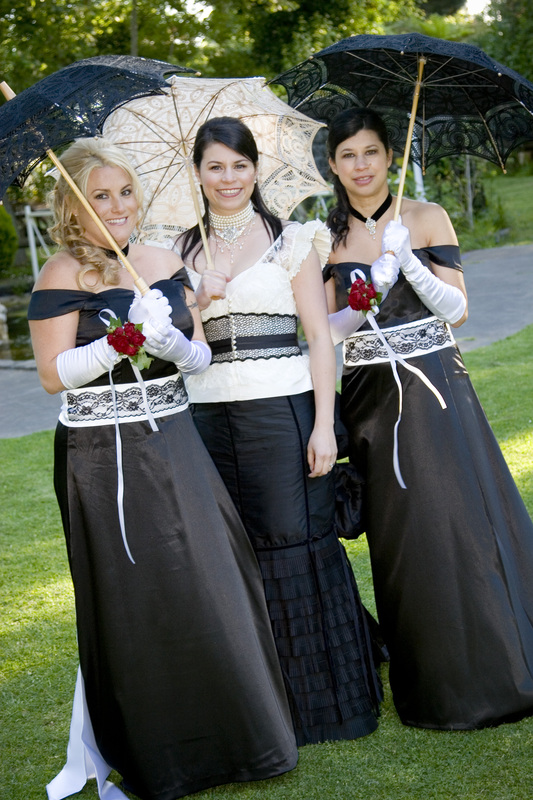 These beautiful black and cream wedding gowns with parasols, reminded us of a modern take on the ‘Southern Belle’. Southern Belle, (derived from the French word belle, ‘beautiful’) is a description of a young woman of the American Deep South’s, upper socioeconomic class. A Southern belle of that era was keenly aware of the popular fashion of that time who typically wore a hoop skirt, a corset and pantalettes. They also frequently carried parasol umbrellas and hand fans. As was fashion at the time, these young women shielded themselves carefully from the sun, as a sign of tanning was considered working-class and unfashionable. Southern belles were expected to marry respectable young men, and become ladies of society dedicated to the family and community. The beautiful gown below, has an intricate black bodice, with gold, black, pearl and silver beading. Another take on the traditionally wedding dress. The modern Southern Belle, however, is confident and doesn’t need the approval of others. So the dress style, while reminiscent of the era, no longer typifies the old fashioned ideals. Remember, the Southern Belle style is elegant, confident, strong, romantic, warm and, above all, fun! True Bride is a tribute to Australian brides. Home to the Bride of the Year Competition and the Good Wedding Guide. With over 15,000 wedding suppliers across Australia, a fantastic resource for planning your wedding day.